Ping Eye2 irons made before April 1990 caused one of the most controversial golf battles of all time. TV viewers are often confused by the intricacies of golf rules. They see some players penalized for things over which they apparently had no control, while other players receive unexpected benefits after poor shots. Conflicts over the strict regulations that determine whether a club's use is legal rarely come to the public's attention. That wasn't the case when the PGA Tour and club maker Ping disagreed over the shape of grooves used on irons -- a disagreement that dragged out for two decades. During the late 1980s, innovation in equipment design caught golf's regulatory bodies off guard. As the USGA and PGA Tour scrambled to determine how much the new designs might change the game, Ping introduced its Eye2 irons, which used square (U-shaped) grooves instead of traditional V grooves. The Eye2 irons met with disapproval of tour officials, who held that square grooves allowed players to put more spin on balls sitting in short rough, making it easier to control the ball and eliminate "fliers" -- balls that came out lower and flew farther than expected. The USGA, the main regulatory body, felt that the grooves made no noticeable difference and approved their production. The PGA Tour countered that square grooves gave strong but less accurate players an unfair competitive advantage over other players. In 1989 the tour voted to ban the grooves from competition play. Ping disagreed with the tour's conclusion and filed suit. A federal judge ruled that tour officials had employed questionable procedures to get the voting results they wanted. Eventually Ping and the tour reached a settlement that indefinitely allowed the use of pre-1990 Eye2s but not newer models. This uneasy situation continued for two decades. In the meantime, the USGA eventually decided that square grooves provided some advantage and began dictating more stringent regulation. The situation might have continued indefinitely had it not been for another confrontation -- this one between pros Phil Mickelson and Scott McCarron. In early 2010, Mickelson became upset over a change of heart by the USGA regarding the grooves on new clubs made by his sponsor, Callaway. In protest, he put a 20-year-old Ping Eye2 wedge -- still legal under the court settlement -- in his bag. McCarron accused Mickelson of cheating by using the Ping Eye2 wedge. Several other players followed Mickelson's lead. The tour suggested that a "local rule" could be made to prevent the club's use, but Ping chairman John Solheim reminded the tour that the court settlement ruled out such an action. Mickelson used the situation as a platform to call for a final resolution of the issue. The public battle between McCarron and Mickelson created a situation the tour couldn't ignore. Perhaps seeing an opportunity to give club manufacturers more voice in the development of equipment regulations, Solheim made public statements that indicated he might be open to discuss the court settlement. After meeting with PGA Tour Commisioner Tim Finchem, McCarron publicly apologized to Mickelson. More importantly, Solheim and Finchem held meetings of their own and reached an agreement. 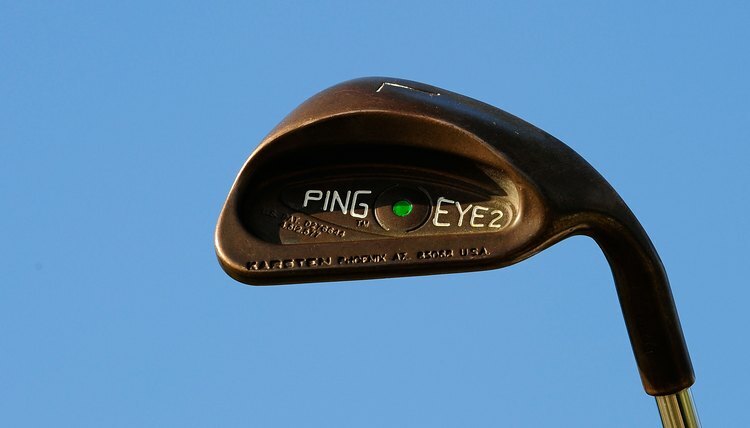 In early March 2010 the old Ping Eye2s ceased to be legal for professional competition. How Much Does a Professional Golfer Pay to Play in a Tournament? What PGA Event Has the Biggest Purse?